I benefit from personal sensory issues which cause radical direction shifts. My unconscious issues, apparently, are the undisputed project manager at all times. 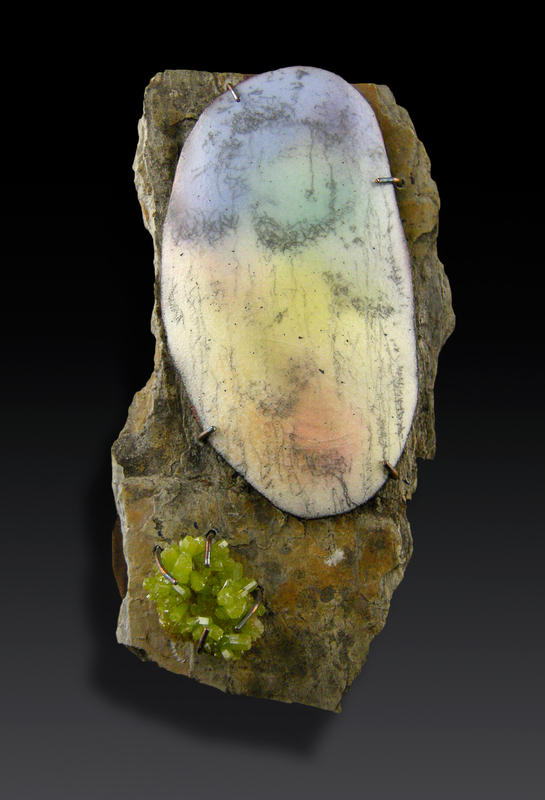 Through my enameling pursuits I explore ideas about current brain-dominating subject matter. Frequent mind disturbances include nuclear power, planet degradation, imaginary space objects and creatures, molecular level shapes, mathematical pursuits. As a general rule, my work is an attempt at resolving the battle for dominance between chaos and geometry, expressing inner turbulence through abstract drawings. Having participated in events related to war, the environment, and human rights, my work seeks to offer a platform to invite the viewer into a space of speculation and hopefully, discussion. Each series consists of multiple pieces, all grouped around a specific theme which I may leave for a time and return to again in another year. 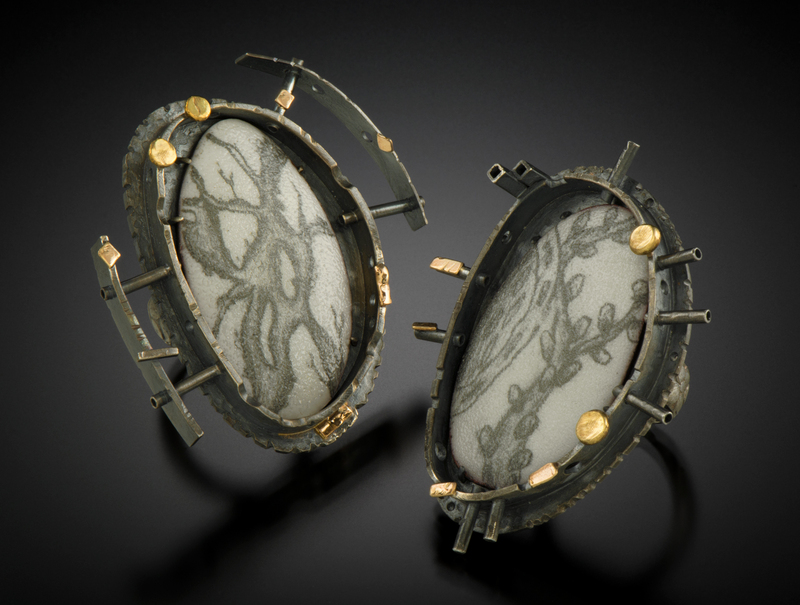 My work frequently employs holes/piercing or broken objects, signifying decay, erosion or corruption, instability, alarm. I create the drawings either with dental tools scratching through hardened liquid enamel, graphite drawings on acid-etched enamel, or other methods of black line creation. Successive torch-firings render the drawings permanent, in addition to adding color layers. 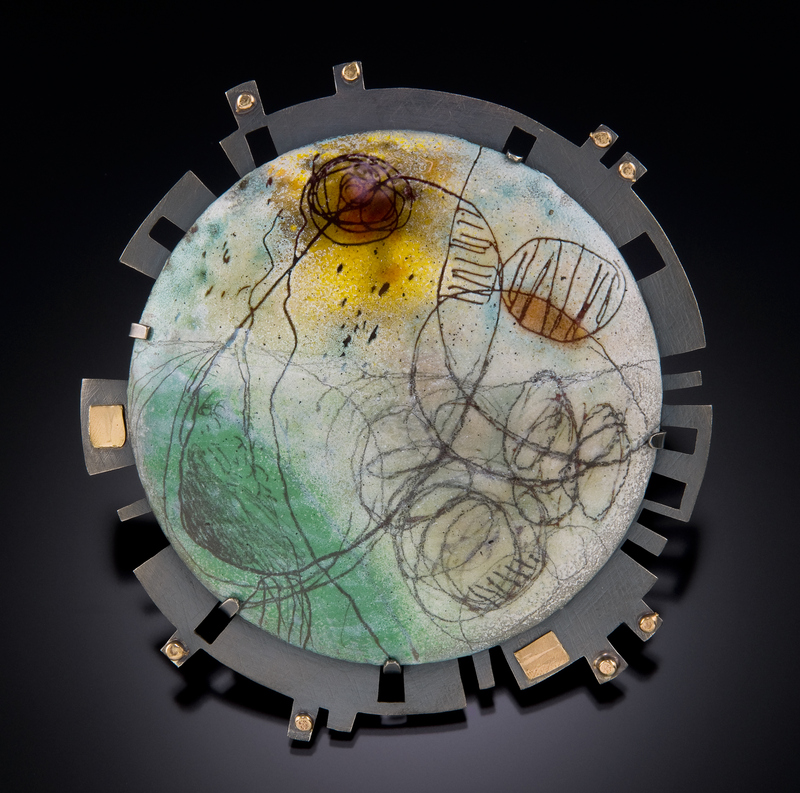 After the enamel piece is complete, a setting is built to hopefully unify the subject matter with the connected objects, where I rely on my definition of beauty, first and foremost, to attract and connect the observer.